All smart phones today give you the opportunity to customize all the content you are interested in so that it will be more accessible for you in your everyday life. One way you can take advantage of this, is by adding bookmarks on your smartphone's home screen, so you can access your favourite websites in a faster and more efficient way and also avoid having to type the URL every time. 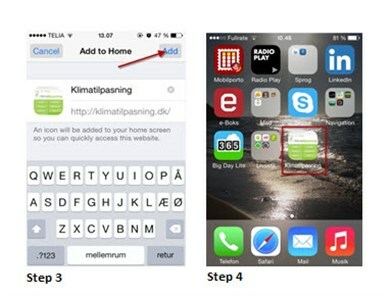 Here is a brief guide to how you add klimatilpasning.dk on your iPhone, Android phone, Windows Phone or tablet. Firstly, go to www.klimatilpasning.dk with your phone or tablet. As soon as the webpage opens you click on the "share-button" which is located in the middle on the bottom of the page. (See step 1). You will see 9 different symbols. Click on "Add to home screen" (See step 2). You will be directed to the "Add to home" page. The webpage's name will be added automatically - it is possible to change this to another name if desired. When you are satisfied with the name, you click "Add" in the top right corner (see step 3). 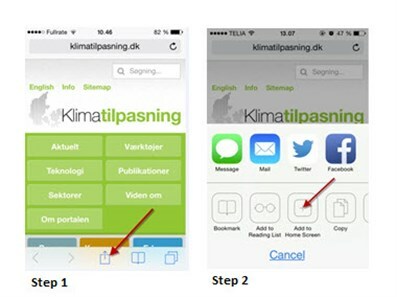 You have now bookmarked www.klimatilpasning.dk and you can find it on your home screen (See step 4). You can always delete the bookmark - you delete it the same way you delete other content on your iPhone/iPad. The way you place a bookmark on your home screen on an Android phone varies by the phone's design and the browser you use. However, there are many similarities. 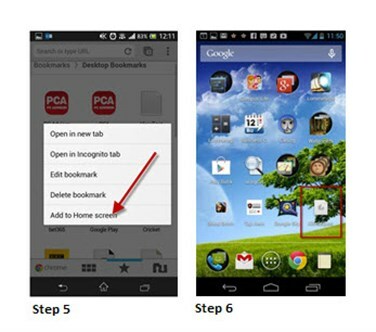 The following steps and pictures give a general idea of how to save a bookmark on an Android phone. The images below are taken from a Samsung Galaxy S5 model where we have used the default browser. 1. Firstly, go to www.klimatilpasning.dk with your phone. As soon as the page opens, hit the settings button (the symbol with the three vertical dots in the top right corner - see step 1). 2. When you have hit the star symbol you will be directed to the bookmarks menu. Here you press the '+' icon "Add bookmark" (See step 2). 3. On the next page you will see that the webpage's name will be added automatically. It is possible to change this to another name. When you are satisfied with the name and the file it is located in, you hit "Save" in the top right corner (See step 3). 4. Go back to the bookmarks folder (See step 4). When you see your new bookmark that you want to place on your home screen, place your finger on it and hold it in until another menu pops up. 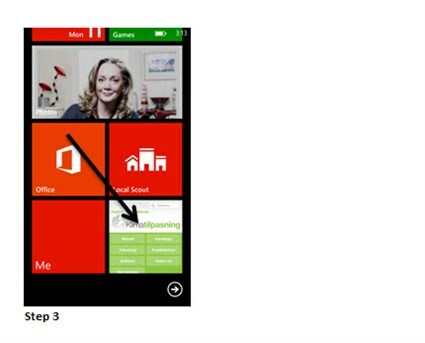 In the new menu you will see a list where there is an option 'Add to Home screen' (See step 5). Press this option. 5. 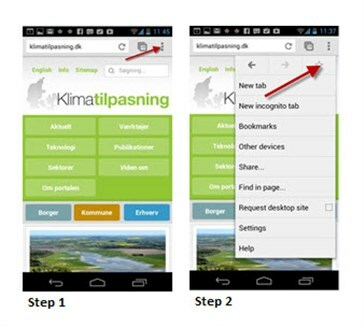 You should now be able to see your new bookmark for www.klimatilpasning.dk on your home screen (See step 6). The bookmark can always be deleted - you delete it the same way you delete other content on your Android phone. If you use another browser than the default browser, in some cases, you have to press 'Options' first in order to see the star icon (Step 1). 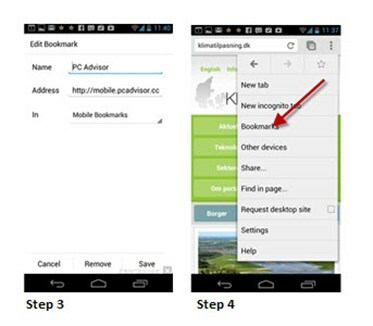 In some cases you might have to find the bookmarks menu yourself as soon as you add a new bookmark (Step 3) in order to see the new bookmark to klimatilpasning.dk. To do this, go to 'Settings' and a new list pops up with different folders. Firstly, go to www.klimatilpasning.dk with your phone. When you see the page, press the settings button (...) on the bottom of the page to the right. After pressing it, a menu will appear that asks you where the new bookmark should be saved - you press "Pin to start". 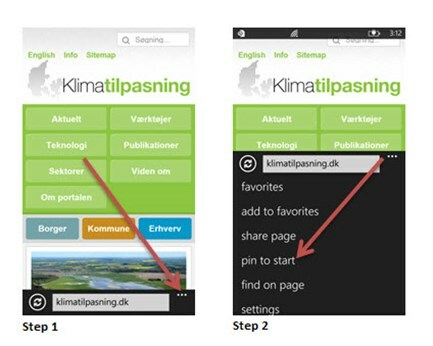 You have now bookmarked www.klimatilpasning.dk and it can be found on your home screen.